“My journey into art has come from a career in Architecture. My love of technical drawing has matured from using just an ink pen and stippling to create light and shadow with dots of ink to now more excitingly using a hammer and nails. 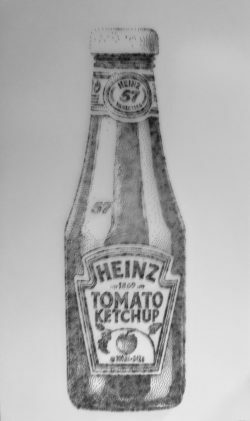 I have always been fascinated with how little information the brain needs to interpret a picture and love the simplicity of a picture made up of just dots. The whole process thrills me, taking just a hammer and a box of nails and arranging them into a piece of art. 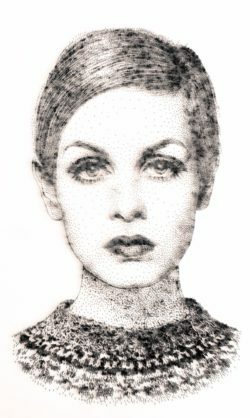 My work is based initially on a photograph which I painstakingly reproduce by stippling with an ink pen. 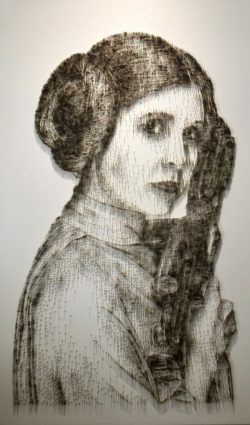 The inked drawing is then enlarged to mark out where the nails go and then the nailing begins…many thousands of nails later I have the finished piece. Since this time, David Foster has had successful solo exhibitions in galleries across the UK. Having completed many personal and business commissions, some of Foster’s clients and collectors include Nissan USA, SKY Sports, Carraghers New York, Hotel TIA Liverpool, Steven Gerrard and Freddie Flintoff. 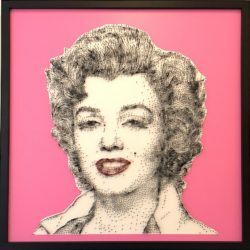 Today, Foster focuses many of his pieces on some of the world’s most loved iconic faces. Each artwork is incredibly impactive, unique and tactile and must be viewed in person to be fully appreciated.